Voting is the most sensible expression of social will. It enables people to decide and reveal preferences about politicians’ acts, policies’ effects and different levels of public intervention. This post pretends to link some crucial concepts that we study in Microeconomics course, explain why sometimes democracy gives unexpected results and how important are the assumptions of revealed and well-behaved preferences. Individuals who have preferences and want to maximize their welfare through public and private consumption (considering a budget constraint in which taxes are included as the indirect counterpart from public provision). The Social Institutions that want to maximize Social Welfare and find an equilibrium, which can be different from the individual optimal solution. Politicians, more benevolent or more selfish, who want to be infinitely re-elected by pleasing their voters (who can punish politicians if they deviate). Although each politician has its own ideology and ethical belief, economists have tried to find a way to explain people’s desires and performances in the electoral game The rules are simple: citizens have different needs and they are willing to pay for welfare. However, payers and beneficiaries are seldom the same, moreover, free riders and externalities insist on stiffening our problem, which may lead to under-provision. The most difficult analysis is to reveal preferences and to aggregate them in order to define the most important function, which tells us what people need and how they value it. In the real world, it is completely impossible to design a beautiful utility function or continuous indifference curves, linking bundles with the same value for citizens. Therefore, governments may ask voters to define their preferences (and the easiest way to do so is) by ranking bundles or options with the help of public surveys or referendums. Actually, politicians have the incentive to reveal citizen’s preferences in order to prepare persuasive speeches and move themselves to a good place in the Downs Avenue. After beating the first winner (A), C becomes the final winner. However, would this result be the same if the fist election opposed A and C? No, because C would be the first winner and would lose against B (1+2 vs 3). 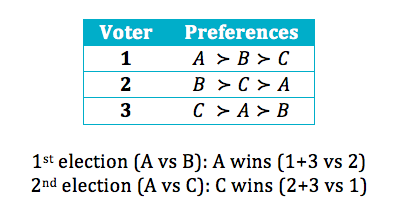 In the Condorcet’s Election, the Voting Agenda determines the result (the winner is always the last voted choice). Issue-by-issue, party X would win on every subject. However, if people choose parties to represent them, a majority of voters will elect party Y. This paradox presents one of the failures of the representativeness of parties. The Additional Support Paradox considers strategic voting (of 21 voters) in a majority runoff election (the winner must have 11 votes, otherwise there is a second round between the two most voted). In the first election, there is no absolute majority. Then, a runoff is held between choices B and C. It is easy to conclude that the winner is B (13 – 8). Now, imagine that B receives the additional support from three ‘C-voters’. Still, we have no majority and the runoff will oppose choices A and B. Now, the final winner is A (11 – 10), despite of the additional support B has received. Categories: Efficiency, Microeconomic Policy Analysis, Public Goods, Rational agents | Permalink.